Designated a NNL in 1969, the Baker University Wetlands is an example of undisturbed wetland prairie. Kansas, who knew? 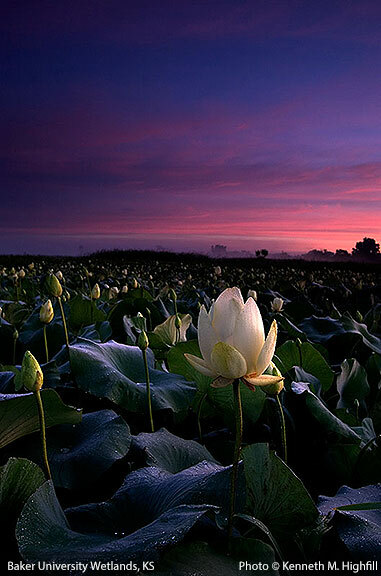 Instead of the usual sunflowers, a striking photograph of American Lotus (Nelumbo lutea) at dawn in the Great Plains is the top winner in the 2013 National Natural Landmarks Program Photo Contest. The competition is sponsored by the National Natural Landmarks (NNL) Program of the National Park Service, which promotes conservation of sites that contain outstanding biological and geological resources, regardless of landownership type. Nearly 600 sites have been recognized for their outstanding condition, illustrative value, rarity, diversity, and value to science and education. 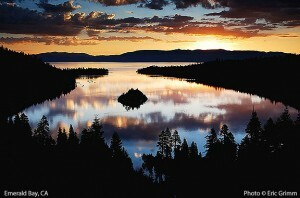 Designated a NNL in 1968, Emerald Bay was formed by moraines as parallel glaciers receded. One of those 600 sites is the Baker University Wetlands, designated a National Natural Landmark in 1969 as an example of undisturbed wetland prairie, where Kenneth M. Highfill of Lawrence, Kan. captured the winning image. 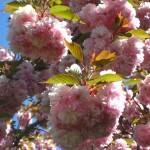 More than 260 species of birds and more than 430 species of plants have been recorded at the site. Canaan Valley contains a large aggregation of Pleistocene habitats rarely found in the eastern US. It is unique as a northern boreal relict community here by virtue of its size, elevation and diversity. This site was designated in 1974. The 10th annual contest drew 88 images representing 71 different National Natural Landmark sites across 31 states and Puerto Rico. Second place went to Eric Grimm of San Diego, Calif. for his photo of a reflected sunrise at Emerald Bay at Lake Tahoe, and third place went to Joseph Henry of Davis, W.V. 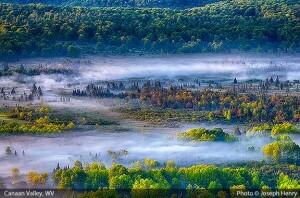 for his image of the Canaan Valley in northeastern West Virginia. The three winning photos and 10 honorable mentions will be featured in the 2014 National Natural Landmarks calendar. Where’s your nearest National Natural Landmark? Check the list (current to 2009) here. Recently I tried my hand at canoeing on the Gowanus Canal as part of my research for a Boating Times article. Having never been face-to-face with a Superfund site, I wasn’t sure what to expect. I’d heard things about smells. And poop in the water. On a warmish Saturday, Shannon Leigh O’Neil and I ventured down to the Gowanus Dredgers Canoe Club’s dock at the end of Second Street. At first glance, I felt relieved. It didn’t smell like a latrine, but the surface of the water was dappled with iridescent pools of oil, and clods of unidentifiable garbage floated lazily past the dock. Gingerly I climbed into the canoe for my free 15-minute cruise on one of the most polluted waterways in America. The breeze freshened, as William Scoresby would say, as I paddled awkwardly up the canal towards the Union Street Bridge. The westerly wind turned around my craft embarrassingly. I almost ran into another canoe (the occupants pushed me off with their oars). I saw a few house sparrows, mourning doves and a mockingbird fly overhead, but at eye level the Gowanus seemed utterly lifeless. My sources at the Gowanus Canal Conservancy and the Gowanus Dredgers Canoe Club said there were fish, crabs and invertebrates under the olive-green surface. Maybe the Brooklyn Atlantis, the subject of my Boating Times piece, is better equipped at finding aquatic life. Having survived my brush with hazardous waste, would I do it again? Yes. 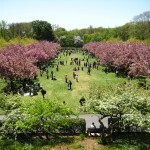 Shannon Leigh O’Neil and I relaxed for a few hours at the Brooklyn Botanical Garden one spring weekend. 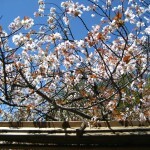 The cherries and Japanese Garden are the most photogenic and classically beautiful areas of the park. I happened to discover the native flora garden, a semi-wild plot of upland woods, bog plants, ferns and wildflowers. While our native flowers aren’t always the showiest, I love their subtle dignity. 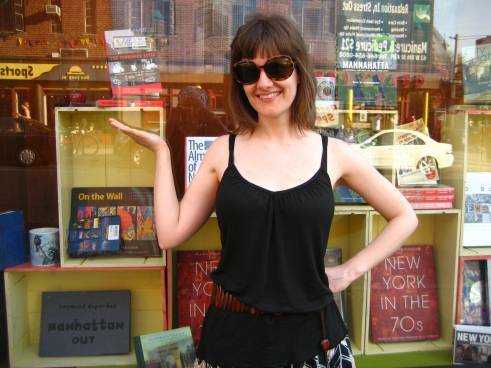 Here I am in front of the Barnes & Noble at 6th Avenue and 8th Street in the West Village–and that’s my book in the window!